In the last month, we have learned that an oil spill in the Great Australian Bight could be worse than the Deepwater Horizon event with oil reaching all the way to the Great Ocean Road and Sydney’s Bondi Beach. In response to this, the oil companies have told us they will weigh the risks seriously and promise that they won’t proceed without a plan. But we shouldn’t trust them. In 1973, the Ford Motor Company published an innocent-sounding memo titled, 'Fatalities associated with crash-induced fuel leakage and fires'. The document, which went on to be known infamously as the "Pinto Memo", used cost-benefit analysis to compare the price of modifications to the Ford Pinto to the societal costs for injuries and deaths related to fires caused by a known design fault. In the memo, Ford estimated the cost of modifying the Pinto’s fuel system to be $137 million across the 12.5 million cars manufactured. If the system was left unmodified Ford estimated there would be an additional 180 burn deaths and 180 serious injuries per year, which would cost around $49.5 million. A maths problem — more than $130 million to fix, almost $50 million to pay up. The Pinto was not recalled. "BP said in a 2016 report that oil spills would be '... a welcome boost to [local] economies.'" The Pinto Memo was quoted as a key factor in a jury’s 1978 decision to award $125 million in damages against Ford in a case involving the rupture and explosion of a fuel tank during a crash. Anyone who has seen the movie Fight Club is familiar with this scenario, but many do not realise it was based on a true story. If you think the above case is an example from the distant past then think again. It should no longer be a surprise that almost half a century after Ford wrote its infamous Pinto memo and rolled “the barbeque that seats four” out the door companies still think that way. But we should learn from it. In offshore oil drilling, there are different ways for assessing risk: ALARP and ALAP. Despite their similar sounding acronyms, they are miles apart. ALAP stands for “as low as possible”, while ALARP is “as low as reasonably practicable”. It turns out “reasonably practicable” is a very wide door that includes a whole host of financial considerations. If you don’t want to drill a second relief well next to your risky deepwater drilling project or have a capping stack on hand – both measures the oil companies admit would be preferable for controlling a blowout but costly – and, instead, would prefer to wait the 85 days it took to stop the Deepwater Horizon, then that’s fine. In fact, documents from BP reveal it would be “highly unlikely” they could find a relief well if they needed one to stop a blowout and that a capping stack would be unable to be used one-third of the time. 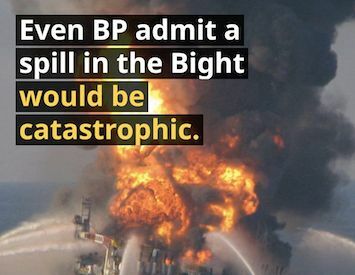 The risks of not having these at hand are “reasonable” according to BP. Professor Rick Steiner was recently in Australia to launch his report, 'Crude Intentions: Exposing the Risks of Drilling and Spilling in the Great Australian Bight'. This happened in Alaska, the oil industry thought that everything was fine with their tanker system until the Exxon Valdez slammed into a very well marked rock reef. In the Gulf of Mexico [Deepwater Horizon] BP and Transocean thought they had everything worked out, no problem, be happy - until it wasn’t. This comfort with taking risks makes more sense when you remember the Ford Pinto, remember the communities BP thinks would “welcome” oil spills — and remember that companies just do not think of risks in the same way as communities. let’s not forget the 11 workers who died. 6 years after Deepwater Horizon oil spill, thousands of people are still sick https://t.co/c6YPTcr7Hw via @grist"Gulf of Mexico"
That’s what we get when we swallow the “acceptable risks” that large companies give us. They may have to pay. But it’s just a math problem for them. For an industry that earns trillions and can bounce back into profit a single year after the worst oil disaster in human history, that math problem is easy. These consequences are all part of the plan for the companies that do not have to live with them. When the Ford Pinto rolled out of the production line after a memo saying there could be 180 people killed a year due to a design flaw, that was all part of the plan. If oil began to spill into the Great Australian Bight, destroying the marine life, crippling economies and stealing the beaches and seas from future generations, the oil company’s documents show that the company considered it would be a “welcome boost” to the economy. A “welcome boost” — regrettable, but all part of the plan. So when an oil company tells you they have looked at the risks and have "a plan", remember it means something different to them than it does to you. You might be horrified at what their plans really are and exactly which risks they think are “acceptable”. Simon Black is the senior media campaigner for Greenpeace Australia Pacific. You can follow Simon on Twitter @mrsimblaa. What does Japan’s whaling announcement actually mean? 22 January 2019, 7:00am What are the ramifications of Japan's decision to resume commercial whale hunts?